More than a decade ago my non conosseur intutition made me buy the book The classic pasta from Giuliano Hazan. That book soon became my pasta Bible. I´ve look for recipes so often in these years than I see Giuliano and her mother Marcela, who died recently, as part of my family. 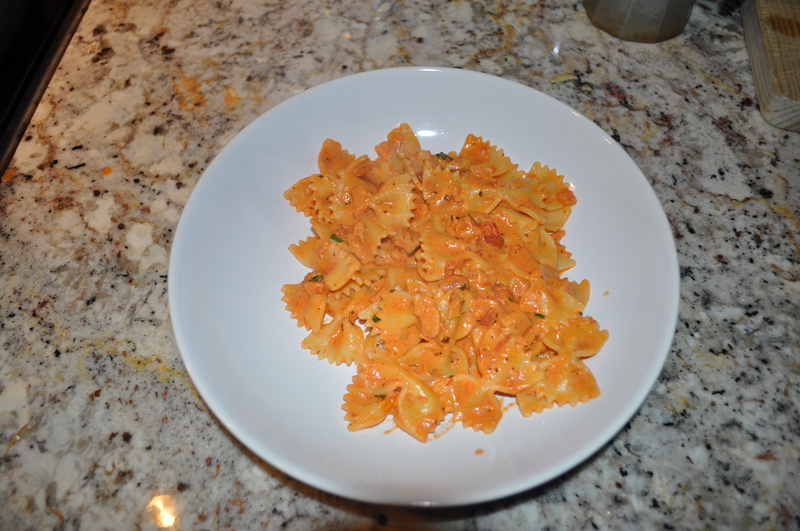 Last night I made again a great classic that my kids love and which is perfect for the Pacific NW, as Marcelo confirms in his book: Farfalle al salmone, with Coho salmon. I usually prepare it with salmon leftovers, because I don´t wanna spoil a pound of this sea blessing that we have the luck to enjoy here in Seattle area. Salmon is a great fish for kids, with good quality fat acids to feed their energy and minerals to help their hyperactive brains. And they will love the soft flavor of this recipe, as is made with tomato sauce and whipping cream! 1) Fry the garlic and chili powder in olive oil until it has golden color. 2) Add the tomato sauce and a pinch of salt. Cook slow for 10-15 minutes. 3) Boil 1 gallon (4 liters) of water. Add one spoon of salt and the pasta. Cook al dente. 4) Add the cream, the salmon and another pinch of salt to the tomato sauce and cook until the cream is been reduced (10 min aprox). Add the basil and turn off the cooking fire. 5) Strain the pasta, blend with the sauce and add parmesan shredded cheese. Serve immediately. * I love Trader Joe´s marinara sauce and Classico sauces. Keynote: You can prepare and freeze the sauce previously.